Most active ingredients, when topically applied, for example in skin creams, penetrate only the superficial layers of the skin and cannot get down to where they are most needed. Acthyderm® from the Italian company Microlab International is based on a process called Mesoporation. This patented procedure allows active ingredients such as hyaluronic acid, phosphatidylcholine, Coenzyme Q10 and collagen to be delivered into the tissue with the effectiveness of injection, according to its manufacturers. Acthyderm®, developed in 2001, is therefore an advanced drug delivery system - medical device - indicated for the administration of active ingredients into the body for medical purposes as an alternative to hypodermic injections. Designed in 2001, Acthyderm® by-passes the resilient surface of the stratum corneum (top layer of skin), allowing the same water based medication commonly used in mesotherapy to be delivered up to 10cms deep within the subcutaneous tissue for any kind of therapy that needs to reach a targeted area. It applies a round strategy of skin penetration enhancement known as Mesoporation. This involves patented electromagnetic waveforms, special electrodes and a methodology of drug application that keeps the pH of the skin and the pH of the substance in mind to increase the transdermal flow. 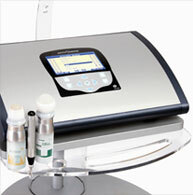 Mesoporation is also known as, No-Needle Mesotherapy, Mesopulse, Hipodermic Transdermal Therapy and Transdermal Lipolysis. Electroporation, Electrorepulsion, Mechanical Pressure, pH gradient. The Electroporation impulses lead to a temporary reorganisation of the cellular membrane allowing the creation of new channels through cells and the cellular membrane, the Electropores, which facilitates the flow of water and non water-soluble molecules. When electroporation occurs, the combination of Electrorepulsion, Mechanical Pressure, pH gradient acts as a driving force to accelerate and deliver the medication to the targeted tissue. European Medical and Aesthetic CE Mark certification. Also approved by KFDA (Korea), HEALTH CANADA and GOSSTANDART (Russia). The clinical trials showed that the amount of delivered medication into the skin is comparable to injections. The American FDA has classified the technology as an alternative to hypodermic injections. The depth of penetration and the dosage of active ingredients delivered to the targeted area have been investigated with scientific methodology by several International Universities and by means ofmultiple systems. Among these clinical trials only Acthyderm® can prove, with scientific evidence, the quality and the efficiency of the technology. Evident proof, made by International Universities, show Acthyderm’s superior performance parameters such as – depth of penetration, quantity of substance delivered, delivery time, selectivity. In other terms its efficiency of transdermal vehiculation. Each treatment session lasts about 20 minutes and it is recommended that you complete a series of 8–10 sessions to achieve the desired medical results. In the first part of the treatment series, it is recommended to schedule several visits close together toachieve the best results possible. Typical benefits are seen after 5 or 6 visits although results obviously depend on the severity of such things as the cellulite or wrinkle condition. The parameters used inthe technology are adjustable to suit each patient and the practitioner can customise the treatment intensity so as to eliminate any discomfort. After each session you may return to normal activity with no downtime. The manufacturer states that the mesoporation process is effective, non-invasive, needleless, completely safe and painless. They claim that there are virtually no risks or side effects for healthy candidates and that no serious or adverse effects have been reported to date. Any likely candidate with a history of allergies is advised to take a patch test before treatment. Due to the electrical output of the Acthyderm® device, treatment is not suitable for pregnant women or those people with epilepsy, pacemakers or any serious psychological or medical condition. Private costs for mesoporation with Acthyderm® treatment depends on the size of the area(s) being treated. A programme of treatments will cost between £tba - £tba depending on the area to be treated. Transdermal application of hormones into human tissue using mesoporation. K. Kosian, M.D., Vienna, Austria. Intra-Cellular lipolysis proof after infiltration of Lipostabil by Mesoporation. Research brought up in the clinic of Dr. Weber using the laboratory of Dr. Peters, Rostock, Germany. Aleks Dobradin M.D., Chicago, USA. Transdermal transport of phospholipids with Acthyderm for the reduction of subdermal fatty tissue. Gerhard Shied, M.D., Gratz. November 2005. Clinical audit of transdermic transport with electroporation. Claudio Amitrano, M.D., Napoli, Italy. European Society of Cosmetic & Dermatological Surgery. February 2001. Luigi Mazzi, M.D., Medical Surgeon - Plastic Surgery, Verona. A pilot study on the efficacy of Acthyderm on active compounds transdermal delivery. Prof. Antonia Sacchi, Research & Development Cosmetic Products, Faculty of Pharmacy, Naples University, Italy. In vivo non-invasive study about the combined efficacy of modified pentapeptide (Stearyl-oligopeptide) formulation and transdermal electrodiffusion system (Acthyderm). Click for ALL Acthyderm ® clinics in the UK & Ireland registered and verified by Consulting Room.